Can I add a signature in Word Online? While Word Online has no command for inserting your signature, you can scan your signature and store it as a picture you insert in the document. Scan the page and save it on your computer in a common file format: BMP, GIF, JPG, or PNG. For information on how to use your scanner, use the manufacturer’s manual or website. Open the file and crop the image in a photo editing program. Save the cropped image to a file, and remember its location. 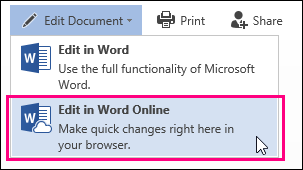 To add the signature to a document in Word Online, click Edit Document > Edit in Word Online. Click in the document to place the cursor where you want your signature to appear. Navigate to the location of your image file, select it, and then click Open. If you already own the Word desktop application, you can use it to do more with signatures. If not, you can try or buy the latest version of Office now.